Warm friendly hospitality, clean comfortable accommodations, and a beautiful riverfront view await you at the Royal Coachman Motel. 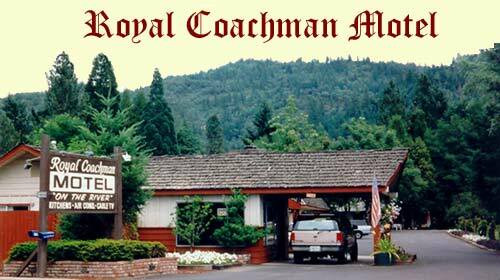 We are located on the banks of the Rogue River in the heart of Shady Cove, Oregon. World renowned for its salmon an steel-head fishing, the mighty Rogue flows right by our motel and offers superb swimming, fishing and river rafting opportunities. From rafting down the river on a tahiti to a professionally guided fishing trip, the Royal Coachman can accommodate you. For family fun, we have adjoining rooms with kitchenette facilities. Rustic and affordable, we are within walking distance to shops, gas stations, grocery stores, a tanning & nail salon, a fitness center, medical facilities, a video arcade, and restaurants for every taste from pizza to fine dining. Just a short drive away is Crater Lake National Park. This year Crater Lake celebrates its 100th anniversary as a National Park.
. . . . . the Royal Coachman Motel is your all season destination offering scenic beauty, river rafting, hiking, biking, golf and world renowned salmon and steelhead fishing on the Rogue River.